City2 Review: Three Pickles was created by men, they evolved, and they have a plan. 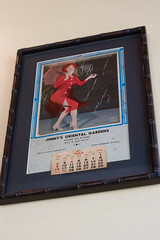 The story of the Three Pickles Deli goes back to the time of Jimmy's Oriental Gardens. Bob Lovejoy, among many others, was a regular of Willy's in the bar. Like everyone else, he was bummed when Jimmy's closed. 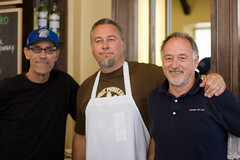 His own deli, the Three Pickles, opened next door and he's run a successful business there alongside his son Clay, and business partner / cook, Bob McCourt. When the opportunity arose to move into the restaurant portion of the former Jimmy's Dining Room, he took it. I recall the Grapevine Market that went in briefly between Jimmy's closing and the Three Pickles moving in. That market/deli sold some very fine Russian chocolate. But it couldn't survive the downturn of the economy and closed. Three Pickles, however, flourished by selling generous sandwiches at good prices and even opened a second deli in Old Town Goleta. And now, the Three Pickles guys have not only taken over the Jimmy's restaurant space, but have expanded their business beyond lunchtime sandwiches. I had the opportunity to sit down with Bob Lovejoy and get some insight into his exciting plans. And they are exciting. To me, at least. Hopefully to you, too! With the expanded space, Three Pickles has now acquired a beer and wine license and starting Monday, 9 May, will extend their open hours to 8:00 pm every night. Lunchtime will still be lunchtime, with a fast turnaround of the sandwiches everyone has grown to love. But starting closer to 4 pm until closing, the space will become a casual spot for people to unwind, have a glass of wine or beer, nibble some unpretentious goodies, and hang out with friends or watch a game. The specialty food will be sliders. Not burger sliders. Hot pastrami sliders! Three for about $7, and amply portioned. I got to sample one! Here's where things get exciting. 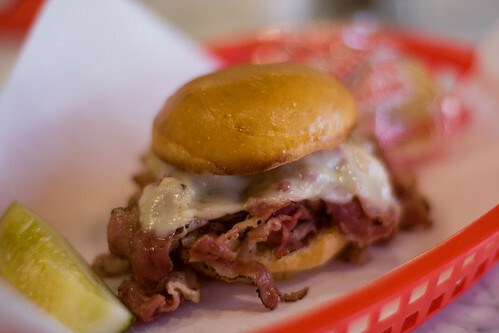 The slider rolls are baked by our local Ethnic Breads, and the pastrami slider will have a sourdough rye roll. The hot pastrami is prepared by the steaming method, based on the same way Langer's does it in LA. You've had the #19 from Langer's right? Right?? It's good stuff. This is the place that many say is better than Katz's Deli in New York. And this is the pastrami style Three Pickles is shooting for. My pastrami was so finely sliced, piled like ribbons onto my slider roll, hot, with melting swiss on top and a light slather of mustard. This is the style of their "Presidio" sandwich, now in a cute little lemonjelly sized slider. Normally I like to share my sandwiches, but this was MINES. Another slider will be based on their popular "De La Guerra" sandwich (pictured, below left). A hot cheese steak with cheddar, cooked onions, plus salsa and avocado. Au jus is available on the side, just ask. A bit like a Santa Barbara version of a Philly Cheesesteak. The Lovejoys did their research down at Phillipe's and Cole's in LA to perfect their sandwich. A final slider on the menu: the Cuban. Tender pulled pork, ham, swiss cheese, slathered with garlic aioli and mustard, baked. You can get all one kind, or mix and match them, the price is still 3 for about $7. 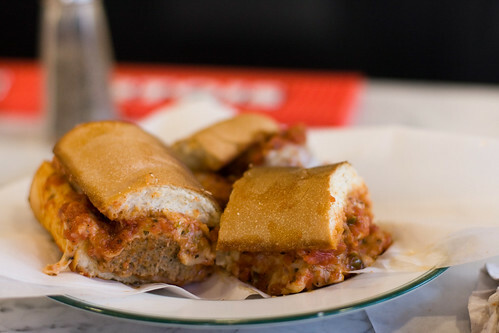 The new space finally allows Bob McCourt back into a proper kitchen, where he can make his fine meatball and marinara sauce from scratch for the Three Pickle's Meatball Sandwich (pictured, above right). I happen to have a soft spot for a good meatball sub (RIP Whitefoot!) and these meatballs were juicy, tender, with a tangy sauce in the right proportions. Of course, the soft bread roll is lightly toasted and the cheese on top melted. But also at night there will be a couple simple Italian main dishes available that you can't get during lunchtimes. These will include a 12 ounce baked ramekin of lasagna, or eggplant parmesan. Best of all, they're priced around $9. Dead reasonable for a sensible and casual dinner in an unpretentious atmosphere. The thought of this immediately brought back memories of late lunches in the back of the old Italian and Greek market on State Street, having some lasanga at little table with a red-and-white checked tablecloth. So what's to drink? Well, there's six beers on tap, including Blue Moon, Sierra Nevada Pale Ale, Stella Artois, and Langunitas from Petaluma. 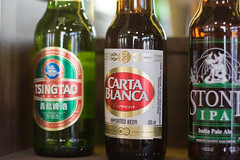 There are also some bottled beers, like Tsingtao for those nostalgic about the former Jimmy's. The wine selection is mostly local and very well-priced. 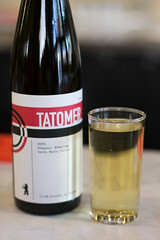 A glass of Tatomer's Sisquoc-dry riesling (Graham Tatomer is very local, and he's the sommelier for Julienne just a few doors down) is $9, while the Ojai red is $8. 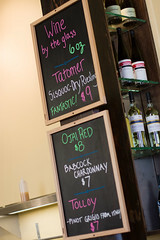 The Babcock chardonnay and Tolloy pinot grigio (an Italian wine) are both $7. Although very good wines, don't expect them in any fancy stemware, these will be 6 ounce pours in traditional Italian wine glasses, no stems. It's all about being casual here, people, and being proud of your blue collar stock. Dinner for under $10, a glass of wine for under $10, and you've dined simply but well. 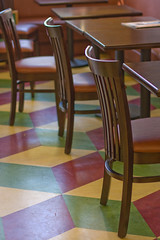 The new Three Pickles interior has many little elements designed by Bob Lovejoy, such as the diamond-cut linoleum floor and the long marble countertop that practically spans the length of the deli. But take a closer look and you'll find other hints of the old Jimmy's. Can you find the calendar with the kistchy little lady whose skirt flips up? It's there, and noticeably hard to reach so that it won't go missing like it did for years at Jimmy's. 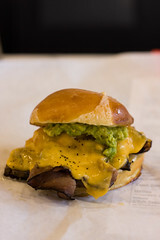 If you want to meet the three pickles, Bob, Clay and Bob, and get a sneak preview of these delicious sliders, particularly the hot pastrami one, the Three Pickles is having a grand opening party this Saturday, from 11am - 4 pm. There will be live music, happy people, and if you're lucky, you can grab one of the sliders coming out of the kitchen for sampling. Yum! The DLG sandwich is my favorite - will definitely be in for sliders. 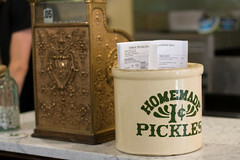 Tried out the new location for lunch Thursday and loved the deli feel of the space. Did he say what is happening in the other half of the building? Ah, Mrs. L -- your review is wonderful and sure to grab some hungry people looking for the right food at the right price! I honestly LOL at your comment "Normally I like to share my sandwiches, but this was MINES." I could hear a five-year old voice on that line. Thanks so much for giving us yet another tasty slice of life! YUM! Oh man. Those sliders look amazing. AND SO NICE to see something good (and local) go in the old Jimmy's spot. Nice write up (and photos). Beautiful, just beautiful... i was watching for the opening and now seeing the review and slider recommendations... wow! top-eats, great info and references in your writing. Thanks!